Small Araucaria Trees | Volcán Lonquimay, originally uploaded by Feffef. I don't know why these trees are called "Monkey Puzzle trees". Their scientific name is Araucaria araucana. The ones in this picture of from their native habitat in Chile. Because of their peculiar form they have been widely planted in gardens around the world. First imported to England as seed (taken as pine nuts from the dinner plate) and cultivated in Pencarrow Gardens, Cornwall. At that time it was very exotic, and in the spirit of general ignorance, was commented on by guests that it would "...puzzle a monkey." There are no monkeys in Patagonia, the indigenous (Mapuche) name is Pehuén. I read that the Monkey Puzzle tree came from Chile. In 1904 a Chilean delegate visiting Oregon gave the seeds as a gift. The seeds were planted all over Orgeon where they began to grow and continue to grow today. The name was inspired by an Englishman visiting Chile and made the comment that monkeys would have a hard time climbing the tree. 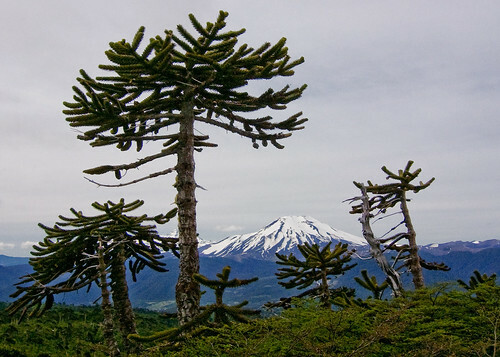 So Chile gave it the name of monkey puzzle tree!